With its new “Proud to Be a Firearms Owner” pocket card, the National Shooting Sports Foundation® is arming the nation’s 100 million gun owners with facts they can use to demonstrate they are law-abiding, safe, passionate in their defense of the Second Amendment and major supporters of conservation through their purchases of firearms and ammunition. I am one of 100 Million firearms owners in the U.S. I am one of 35 Million target shooters and hunters. I am part of a great American tradition. I am a conservationist. Excise taxes on firearms and ammunition purchases combined with purchases of hunting licenses contribute more than $1 billion annually to wildlife conservation and firearm safety education. I store my firearms securely when not in use to keep guns out of the wrong hands. I respect those who have their reasons for not owning firearms, but insist that they respect my reasons for owning them. Recognizing there are many more reasons to be proud to be a gun owner than those included in the card, NSSF invites firearms owners to share their own “proud to be a firearms owner” reasons by commenting on its Facebook page and using the #gunpride hashtag on Twitter, Facebook and other sites. 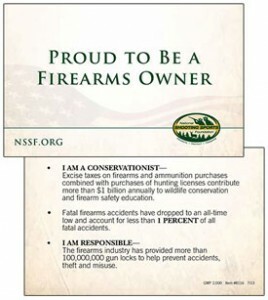 The NSSF “Proud to Be a Firearms Owner” pocket card is available online at http://nssf.org/PDF/FirearmsOwnerPocketCard.pdf. NSSF members can order printed copies of the card from the Safety & Education section of the NSSF member shopping cart.